I've been following his stationery line for a couple years but now it's nice to see many of his illustrations picked up by Society 6. 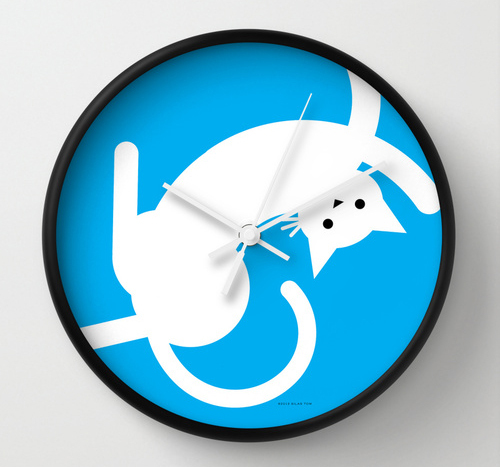 There, you can purchase his work, now feartured on clocks, totes, canvases, shirts and pillows. I'm personally loving the clocks as a perfect way to add something bold into your space. Above is Hounds Tooth + Teal and Mister Hipster. As I'm looking forward to spring and still wondering why I don't live closer to the equator, Rob's work offers that extra dose of sunshine I need- especially now, as Atlanta and much of the South deals with another freezing cold week. Warm up, here. All of the tea towels are made from a super soft 100% cotton and are printed on unbleached flour sacks, approx 28" x 29".